This version of Beauty and the Beast is a busily sumptuous feast for the eyes and ears (even in 2D, which is all Disney showed at a press screening, though it was filmed in digital 3D format). Based on the 1991 animated film (I managed to find a working VCR to re-watch my old video tape), this so-called “live action” story has been expanded visually by director Bill Condon, with additional scenes and characterizations by screenplay writers Stephen Chbosky and Evan Spiliotopoulos, with three new songs by original scorer Alan Menken and new lyricist Tim Rice (ones they wrote for the theatrical production are only heard as leit motifs in the score), while using some original lyrics by the late Howard Ashman that had been cut before. The opening scene of a quite decadent costume party hosted by the cold, masked Prince (Dan Stevens) clearly establishes the live-action difference (and warning: this is the first indication of the deserved PG rating) – yes, the whole castle deserves the spell! (What with its design touches from Jean Cocteau’s 1946 La Belle et le Bête), So we get to see the castle’s occupants before they are turned into non-humans by the enchantress first disguised as a crone, especially the opera singer Madame de Garderobe (Audra McDonald, in full-throated diva mode) and her devoted accompanist Maestro Cadenza (Stanley Tucci). Who could possibly break the spell: can the Prince turned into a Beast possibly fall in love and be loved before the last rose petal falls? Enter Belle (a feisty Emily Watson), with that beloved namesake song though first looking like she steps out of Sound of Music’s hills are alive, among all the classic movie musical appreciations, through her French (mostly British-speaking) village of Villeneuve (named in tribute to the author of the original Beauty and the Beast story, Gabrielle-Suzanne Barbot de Villeneuve -- did you know “the tale as old as time” was first written down in 1740 by a woman?) As well as declaring that “peculiar” Belle prefers books to beaus, it’s wonderful for introducing characters such as Gaston (Luke Evans as a sexist bully ex-soldier, not as doofus as in the animation) and his more amusingly bromantic, not nearly as ridiculous aide de camp LeFou (Josh Gad). Though here’s where we see that Condon’s Baz Luhrmannesque, horror vacui style will not just be for aristocratic over-indulgence, but also applied to what the simple folk do in the village market (a Camelot reference). Belle rushes home to her father Maurice the music-box maker. What a pleasure to see Kevin Kline in a musical – like I saw his first professional stage appearance in The Robber Bridegroom, then years later in the Delacorte Theater, Central Park, production of The Pirates of Penzance that was marvelously filmed. So it’s a bit disappointing that one of the new songs, written for him, “How Does a Moment Last Forever” is not particularly memorable (nor in Celine Dion’s version on the soundtrack album). A later flashback scene added to his back story with Belle’s mother also does not benefit the story. Warning: his travel through the woods, past frightening wolves, and into the Beast’s castle lair is genuinely scary! Belle’s rescue and self-sacrifice to take his place in the Beast’s prison is genuinely gritty and brave! Belying the “live action” description, the characters turned into household goods are mostly just voice-over work for the actors and sing-over, first anxiously with the classic “Be Our Guest” in order to help Belle break the spell: Lumière the French valet (Ewan McGregor channeling Maurice Chevalier) as a candelabra; Cogsworth the butler (Ian McKellen) now a mantel clock; Mrs. Potts the maternal housekeeper (Emma Thompson), as a teapot, and her son Chip (Nathan Mack) as a boisterous cup; the maid Plumette (Gugu Mbatha-Raw) now a feather duster; and Madame de Garderobe now a wardrobe and her Maestro a harpsichord. Then later, beautifully, they ensemble in the new “Days in the Sun” when they long for their human days. The Beast, however, is more the next step in motion capture since Gollum in Lord of the Rings. Stevens was on stilts, wearing a prosthetics muscle suit with a fractal gray bodysuit on top with visual effects indicators when he was with Belle, then with facial capture technology when he was “with” the animated characters, according to the press notes. He wins her over first through a much more extensively seen library than was seen in the animation, then through a waltz. Among the released stats about Belle’s yellow dress: 2,160 Swarovski crystals. 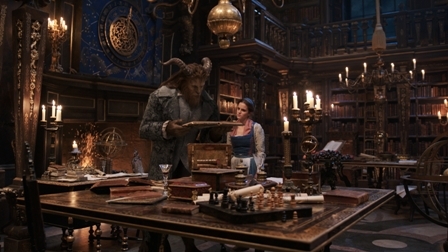 Though songs from the theatrical production were deemed not cinematic enough to include, Stevens gets to belt out the new, gorgeous, heartfelt ballad “Evermore” (an inevitable Oscar Best Song nominee – Josh Groban also covers it on the soundtrack album) as the Beast urgently climbs up the castle tower to keep sight of Belle as she rides away to help her father. Yes, viewers, he has genuinely fallen in love. Though Thompson’s closing version of the title song, as they all frenetically waltz together, just doesn’t have the full emotional benediction of Angela Lansbury’s original, most everyone, of all ages and genders, will be so crying and softly (or louder) singing along it almost doesn’t matter. If they can overcome their exhaustion from watching the film, they can stay through the credits to see the actors teamed with their alter egos and then can also sing along with John Legend’s version.